Apu Winicunca. 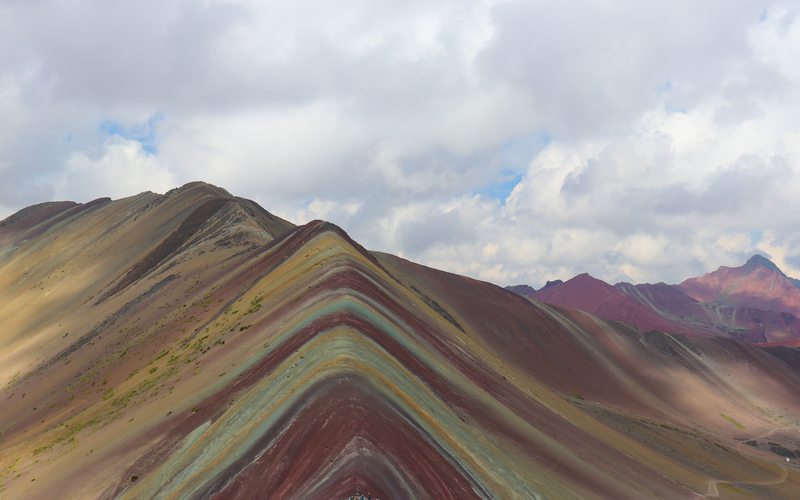 You’ve either seen this mountain in a viral travel video or you’ve never seen, or even heard of, this “Rainbow Mountain” in Peru at all. Rainbow Mountain was only recently revealed when the glacier on top melted, revealing its distinct “rainbow” stripes which were formed by mineral deposits accumulated over time. 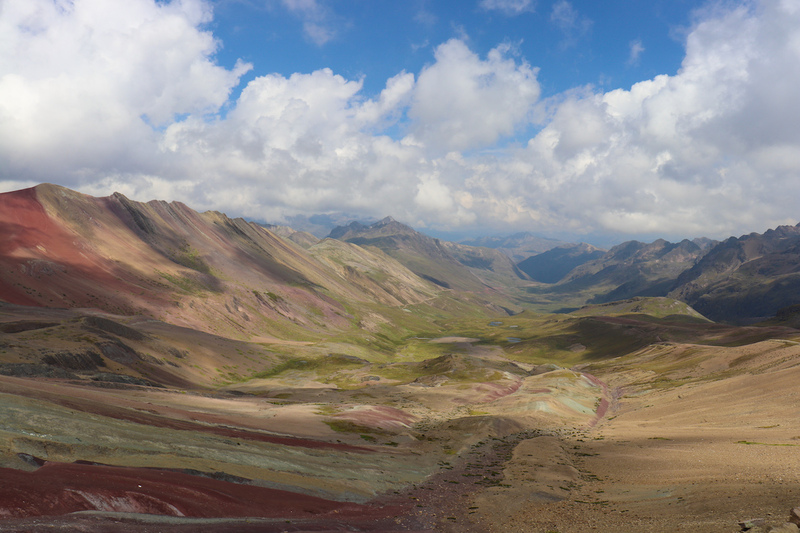 Now, Rainbow Mountain is one of the top hikes and attractions near Cusco but certainly not an easy mountain to summit. The highest peak you can climb up to is around 5,100m in elevation, meaning the 10km round-trip hike can be tough on the body as the air is thin and there’s less oxygen in the air. 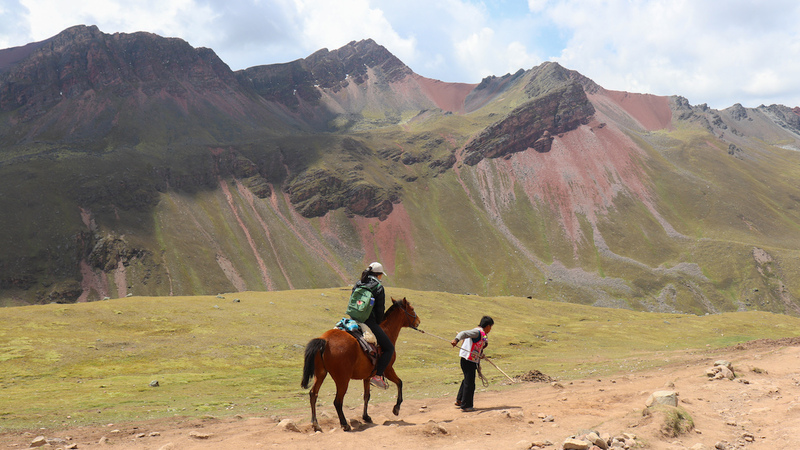 Thankfully, there is an option to rent a horse upon arrival, which makes the journey easier but you aren’t completely off the hook; you still have to get off on multiple points and hike the steepest part to the summit. We were very indecisive about which tour operator to book with. 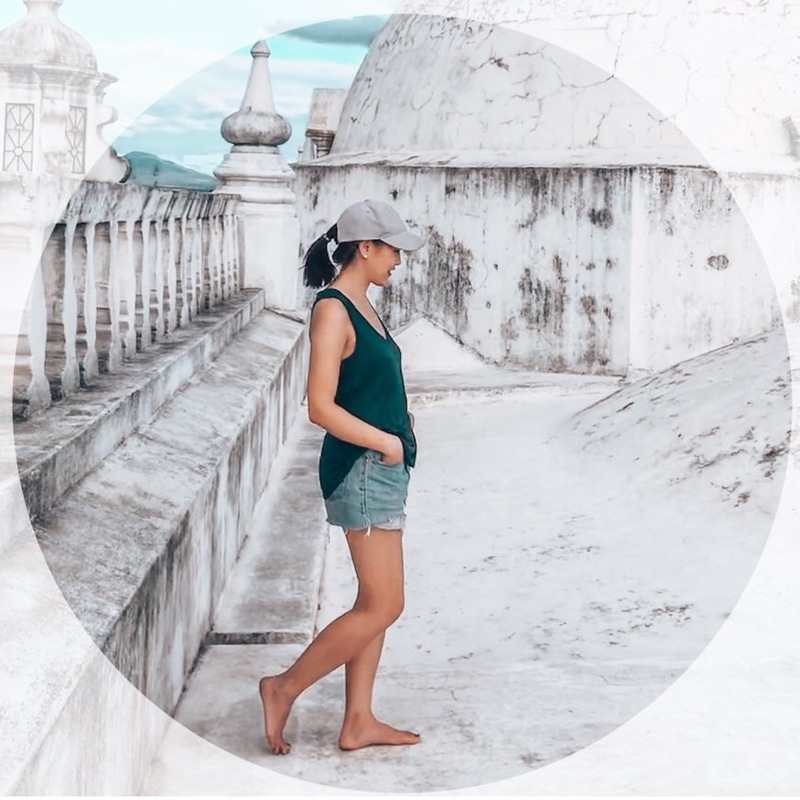 We noticed the rates varied widely, depending on the tour operator you book with, your group size, the quality of your meal, availability of first aid, the English language skills of your guide, etc. We heard the most “luxurious” tours offer a private guide for just your party, as well as a chef to cook you breakfast and lunch?! We booked the night before our hike with a tour company called Cusco Journeys for 60 Sols each, which included transportation, breakfast, lunch, and an English-speaking “guide” but didn’t include the 10 Sols admission to the mountain. On hike day, I can’t be sure if this was the company we actually ended up with because the Trip Advisor name was different from the shared office space name, which may have been different from the actual tour name. In any case, I wouldn’t particularly recommend them. We prepared the best we could before the hike. 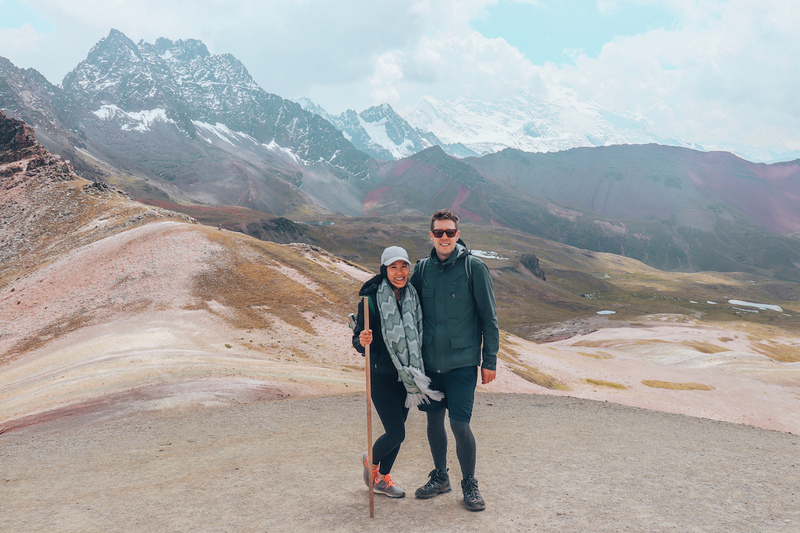 We dressed in our warmest layers (it gets colder in high elevation conditions), packed a poncho for unpredictable weather, and wore lots of sunscreen. To combat the altitude, I had coca leaf tea in my waterbottle, coca leaf to chew on, and we even purchased sorochi (altitude sickness) pills in Cusco to take. I was very anxious the night before our hike began. I had read stories online of “near death experiences“, people passing out on the hike, or being affected by altitude sickness, and all sorts of stories and reasons on why you shouldn’t trek Rainbow Mountain. We had just completed the two-day one-night Inca Trail to Machu Picchu — wasn’t that enough hiking for the week?! But, well, we were in Peru, YOLO, and Steve wanted to do this — so here goes. We were the first in our group to be picked up at 3:45am from our guesthouse in Cusco and spent at least half an hour picking up other people in Cusco. There were about 15 people in the van we were in, plus a driver and a “guide”. Knowing that the winding journey was three hours long, I popped half a Gravol for motion sickness and to help me get a few hours of extra sleep. The views we passed by on the car ride were beautiful. I’ve come to realize the more curvy and dangerous the road, the more beautiful the views! At the highest point of the drive, we got out on the side of the highway to take photos. We made a quick stop for breakfast: a meal of cold bread and butter, and tea. We would come back to this same spot for lunch when the hike was over. 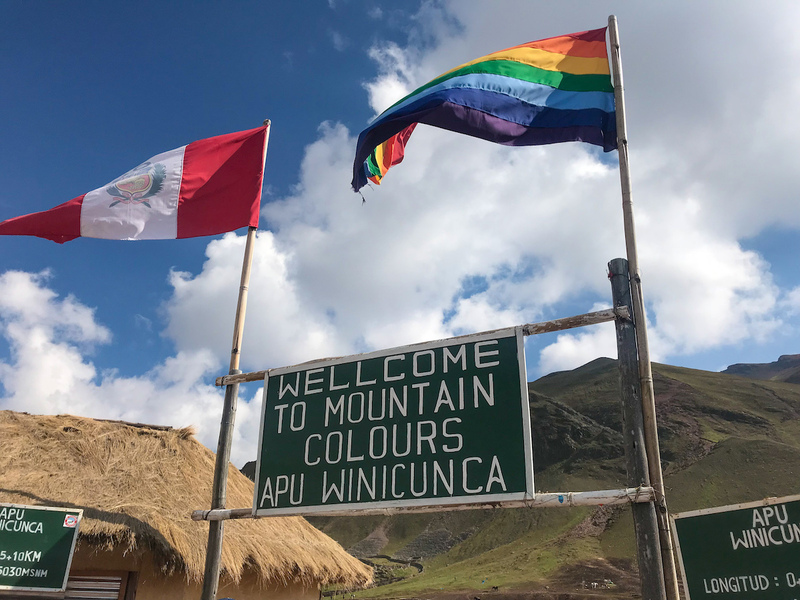 We then continued the drive to the entrance of Apu Winicunca / Rainbow Mountain around 9am. The ride there and back was intense and a bit scary to be honest. The driver was swerving on the road. One of the more outspoken girls on our bus actually got up and told the driver kindly but firmly to slow down. Did it change his driving? Not really. The total driving time was around 4 hours. The road took us to 4100m in elevation, where the hike began. I put guide in quotation marks, because he wasn’t really a good guide. He was more like a timekeeper, or an English-speaking Peruvian that we could ask questions to. But overall he was grumpy and didn’t seem like he wanted to be there. The guide scheduled us four hours to do the 10km roundtrip hike. The estimated pace is 2+ hours up, and 1 hour down. In hindsight, it didn’t seem to matter if you were in a big group or paid a premium to be in a small group. We lost track of our guide anyway, everyone just went at their own pace and met back at the van at 1pm. I saw our guide at the beginning of the hike when he set me up with a local and his horse, and then I didn’t see him again until the hike was over and we met back at the car. Before we even signed up for the Rainbow Mountain hike, I was already certain I would hire the horse option for 90 soles. 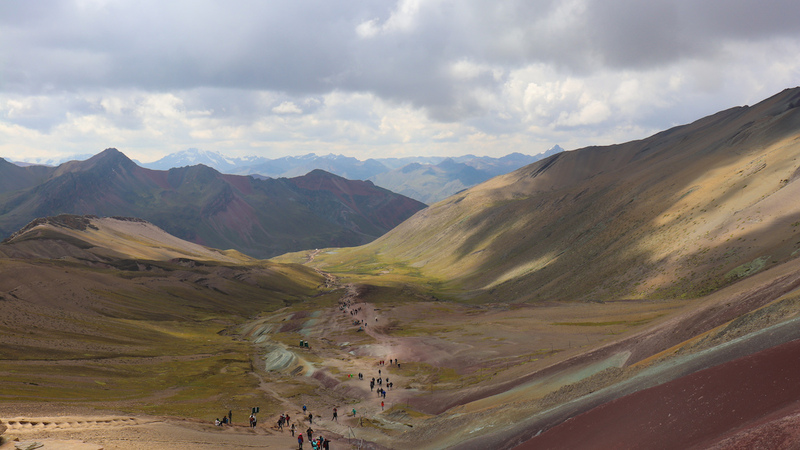 I wanted to enjoy the views of Rainbow Mountain without putting my body through too much strain. At over 4,000m in elevation, the air gets thinner and you are prone to the symptoms of altitude sickness. A few steps would quickly get you out of breath, and any more exertion on your body could cause headaches and other symptoms of altitude sickness. Our guide connected me with the locals who were hiring out the horses, and off we went. In our tour group, four of us went with the horse option. We each had a local “guide” who walked alongside the horse. Even though I took the horse option, I still had to get off several times at steep points — including the final trek to the peak. For walkers, the hike itself isn’t too strenuous — you gain about 900m in elevation over 5km. However it’s the high altitude that gets to you. Despite being on a horse, and Steve on foot, I only beat Steve by about 15 minutes to the peak. (That being said, Steve is probably speedier than average). From the top, everyone below looked like walking zombies with slow, exaggerated motions, and stops after every step. The peak was beautiful, and the stripes are exactly like how you see them in photos. The peak was very touristy, there were locals selling snacks and water, and llama / alpaca ladies that you can take photos with. The iconic Rainbow Mountain photo is the triangular mountain with the distinct stripes. But what I didn’t expect was the vastness of the view and the colours of the surrounding area. In fact, I thought the valley landscape was even more beautiful than the iconic mountain shot. I started getting a small headache behind my ears at the peak. The inside of my nose felt cold, and my lips were dry. Whenever you feel the effects of altitude sickness, the only way to minimize the symptoms is to descend. We spent about 40 minutes at the peak taking photos and eating the snacks we packed. When we left the peak and made our way down, the descent was much easier. As you can see from our photos, the weather was perfect the entire way. But the last 15 minutes of our hike, we heard loud, echoing thunder, and soon enough, the sky cracked open and it started raining, then hailing. I put on my poncho while Steve ran the rest of the way back, as my guide and horse picked up the pace. We made it back to the van shortly before 1pm, and waited for the rest of the group to return. 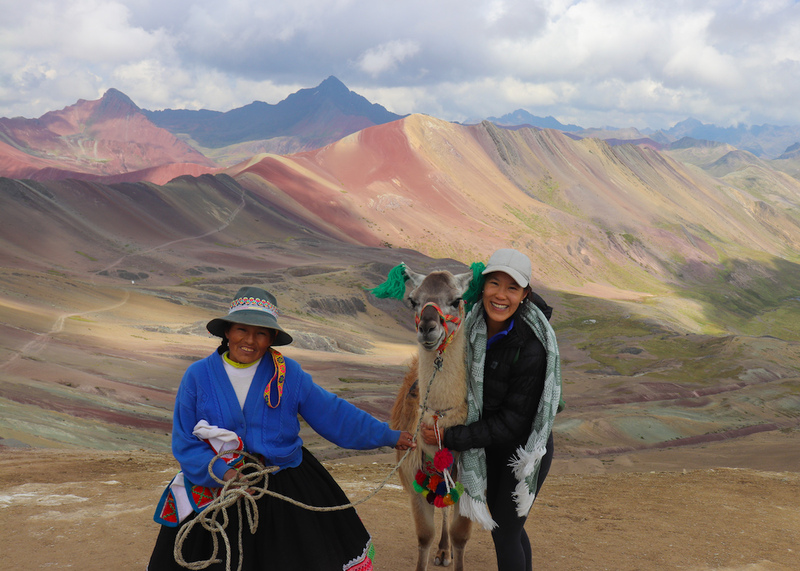 If you have an extra day or two to spare in Cusco, I do recommend taking the tour to Rainbow Mountain. The cost is very reasonable for an all-day trip and it seems like an accomplishment to be at this high of an elevation — especially if you hiked the whole way! To ensure your experience goes smoothly, my recommendation is to prepare well for the hike. 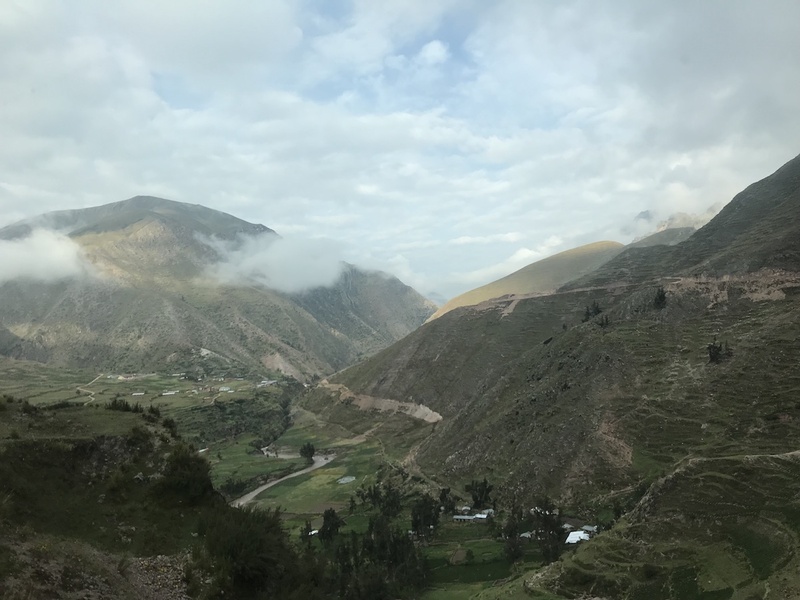 Get as much sleep as you can the night before, dress warmly in layers and bring a poncho, pack water (hot water in a thermos is best), stuff your pockets with Coca Leaves, and take altitude sickness pills as a precaution. Be sure to wear sunscreen even if the weather is overcast; the sun rays are much stronger from high up. Steve got a minor sunburn after this hike! And finally, if you have any doubts about your ability to hike up Rainbow Mountain, or want to minimize your discomfort, I would definitely recommend hiring the horse. I would love to do that hike by horseback. It looks absolutely stunning and I miss horseback riding so much. I’ve never thought of Peru as a destination, but now I am wanting to look into it!